Beaverdam dog food is a premium dry food brand created with the goal of remaining affordable but also containing the best ingredients. All their foods include American grown pork and chicken with prebiotics, probiotics, chicory, and yucca. With Beaverdam, you’ll never find any by-products or artificial colorings and flavors. The company has and always will remain family owned in the USA. The first thing that caught our eye about Beaverdam dog food is its unbelievably low price for such high-quality ingredients. We decided we wanted to take a more in-depth look into this food brand and take you along with us. 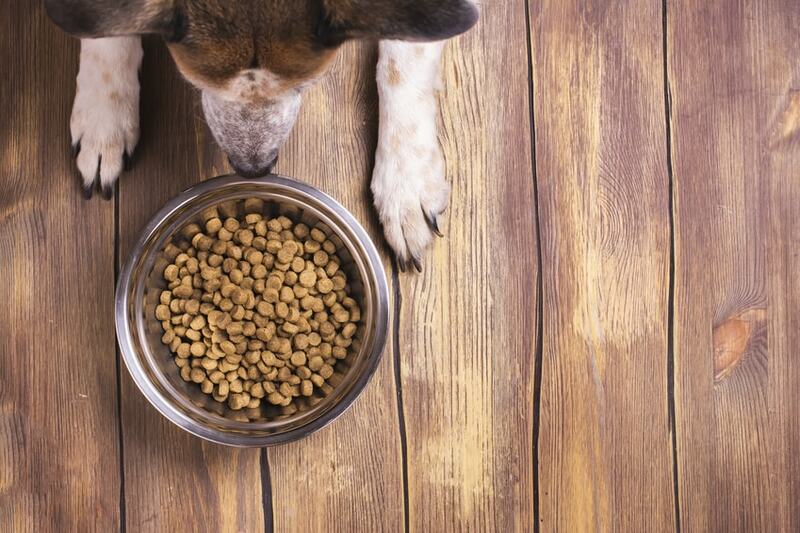 In this article, we’re picking apart every little detail about Beaverdam to help pet parents decide if this is good dog food for their pup. Available at: Chewy, Amazon, and Walmart. The story of Beaverdam starts with a man named Truman Schrock from rural Delaware. He grew up on a farm where hard work and family were the most important values a man could have. In 1961 he married and purchased Beaverdam Farm where they grew corn, wheat, and soybeans. In 1970 Truman began working at the Furst Mcness Company in animal nutrition, feeds, and supplements. During those years he learned a lot about the pet food industry and realized that a lot of pet parents have no idea what they are feeding their dogs and how they could be hurting their pets. After his retirement in 2003, Truman started Beaverdam Pet Food where his primary focus was high-quality ingredients at a low cost. Today the company is standing strong and now offering four different lines of dog food. Truman says he has no desire to grow to the largest company around and he likes that his “small town” business strategy makes him different from the rest. What Types of Dog Food Does Beaverdam Offer? Beaverdam offers a limited amount of foods, but the company says that is what allows them to maximize their ingredients and make sure that every bag contains the best of the best. Each food from this company caters to a specific dietary need for dogs. Below are the four offerings from Beaverdam with a brief explanation of each. Containing two sources of protein (chicken and pork) this food is an excellent dietary balance for active adult dogs. The 21/12 refers to the ratio of protein versus fat, and this line contains real meat as the first ingredient. Judging by the name you most likely get the intention behind this line. This food packs more protein into each bite, so it’s intended for highly active dogs who have a hard time holding weight. The food also contains prebiotics, probiotics, chicory, and yucca for digestion and immunity. The high energy blend contains a higher fat content as well as protein for active and working dogs. The food contains gluten-free ingredients with protein from chicken and pork. All foods from Beaverdam including this one contains no corn, wheat, soy, dyes, colors, or artificial preservatives. This food is intended for pups who have sensitivities to grain. The blend has chicken and pork for healthy muscles alongside omega-3 and six fatty acids for skin and coat health. Eli’s Select is the newest offering from the company and got its name from the owner’s father. Currently, there are no recalls of Beaverdam dog food. In this section, we’re going to take a more in-depth look into two of the Beaverdam food lines. After reading this, you should have enough information to decide whether or not this food brand is the right choice for your pup. This food contains two sources of protein, one being chicken and the other is pork. Beaverdam considers this their “general” food that meets the needs of most adult dogs. The formula contains omega-3 and six fatty acids with vitamin E for skin and coat health. Skipper’s Choice also has prebiotics, probiotics, chicory, and yucca for digestion and immunity. As we make our way down the list of ingredients, there is nothing that stands out as a low-quality component. Overall, Beaverdam contains an excellent balance of nutritious ingredients. This formula has a rating of 4.3 out of 5 on Chewy with 90% of reviewers recommending the product. Many of the reviews state that it was easy to transition their dog off their old food, that they love the flavor, and it helped regulate their pup’s bowel movements. This formula contains extra protein for dogs who have a hard time maintaining their weight. The high protein diet is also useful for active or working pups. Like the previous food choice, this one also contains omega fatty acids and vitamin E for skin and coat health. This brand offers a healthy digestive and immune system from prebiotics, probiotics, chicory, and yucca. All the Beaverdam foods contain high-quality ingredients with no fillers. This particular food line has a rating of 4.6 out of 5 on Chewy with 94% of reviewers recommending it. Some of the reviews state that the food helped tremendously with their dog’s allergies. Many reviewers of all the Beaverdam products express their satisfaction with the price of the dog food as well. Overall, we would highly recommend any of the Beaverdam dog foods for your canine companions. The best way to decide if the dog food is right for your pup is to read reviews from customers who already took the leap and purchased the brand. Overall this brand has an excellent reputation with all of their food lines receiving four stars or more on Chewy. Many reviewers state that the food helped their pup maintain their weight and the transition between foods was easy because they enjoy the flavor. Here are some honest reviews from real customers. My Collie is a new dog! If you’ve made it this far through the review, you most likely see that Beaverdam is an excellent dog food that received one of our highest possible ratings. The food contains some of the best ingredients and dogs seem to love the flavor. The main thing that a lot of other dog foods of the same quality cannot beat is the price. Beaverdam slashes the price of most other brands almost in half, and they do so without sacrificing quality. If you are considering switching from your current dog food to one that is healthier, reputable, and more affordable; we recommend giving Beaverdam a try.